Note: The winner of our last giveaway has been announced and winner has been contacted. See if it’s you! One of our favorite things is when our blogger friends write cookbooks. We know how much work goes into them (and how rewarding it is to hold all that hard work in print! ), so we love helping them celebrate. 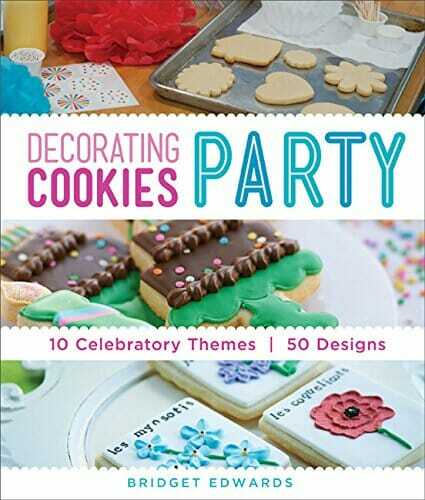 Bridget’s second book, Decorating Cookies Party, was recently released and we couldn’t wait to get our hands on it! * Enter now through next Thursday, October 23. The winner will be announced on Friday, October 24. *Please use an email address you frequently check because that is how we will contact the winner. After contacting the winner, they will have 48 hours to respond; if we don’t hear back within 48 hours, we’ll select another winner. I would love this cookbook so I could make beautiful cookies for my kids and husband– my favorite things! Those cookies look amazing. 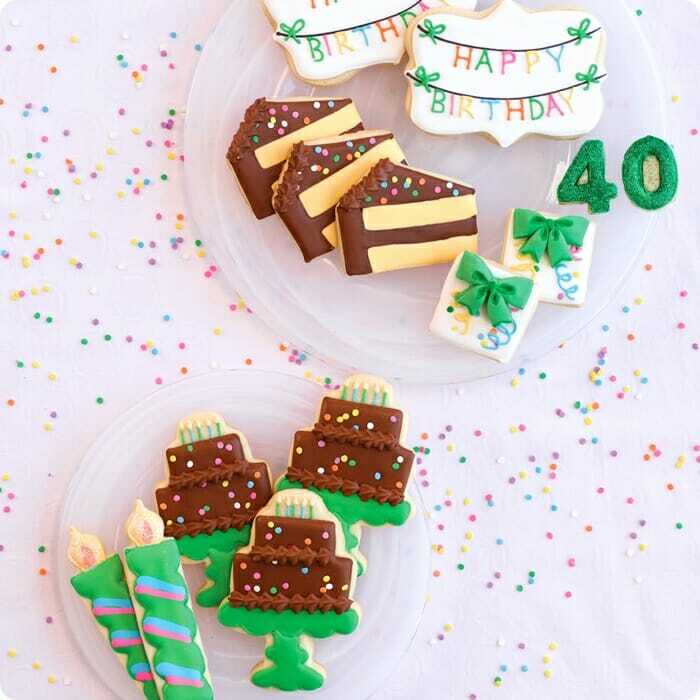 I would love to learn how to create some beautiful cookies like these. Christmas is our favorite holiday to celebrate! I had one of my favorite things tonight… A quiet dinner because all three girls were too busy eating and mmmmmmming to fight or complain about the food. Success! I enjoy celebrating Jesus’ birth at Christmas! I love birthdays. Everybody should be able to celebrate themselves one day a year! My favorite thing is when the kids are all asleep. I mean, I like them and everything, but when they are asleep, I can do things. Birthdays!!!!!!!!!!! Everyone’s birthdays!!!!!!! So much fun to now celebrate my kids’ birthdays…they appreciate it much more than my husband & I can get way more excited & cute & fun 😉 !!!! Christmas & 4th of July are my next choices! I love anything and everything Christmas! I love her other book—awesome pictures! I love celebrating my children’s birthdays!! What adorable little cookies! I have not seen her blog yet! Seeing as though you two are my favoritr, and you recommend her, I will 🙂 thanks! Woops, as for my favorite thing, its every holiday and reason to celebrate! Christmas is my very favorite. Birthdays, Thanksgiving, Easter, Valentines Day, anniversaries, even half birthdays! I love it all and enjoy making these days special and memorable. These cookies are absolutely adorable!!! I’m going to have to check out her blog now! One question, was there also a winner on the Win Kate’s Stuff Scoop post from last week? I love to decorate for Christmas. Ito my favorite! Nothing better than a sugar cookie with almond flavored icing!!! My kids’ everyday accomplishments! Sure love those little monsters! I’ve always loved decorating cupcakes, but I’m just starting to climb on the cookie decorating bandwagon. I would love this book! 4th of July is always my favorite! My daughter is obseessed with decorating cookies. She’d flip if I gave it to her! I love Christmas. I love decorating my house for Christmas. I love celebrating Easter — it is by far my favorite holiday! My favorite thing to celebrate is birthdays! I love cakes, candles, presents, the whole shebang. So adorable. I would love to improve my cookie decorating! I love to celebrate minor holidays (valentines day, st. patricks day, etc.). A little effort goes a long way in making the day special. My favorite celebration is Christmas Eve. We have lots of traditions that are special to me and it’s my favorite day of the whole year. The book looks awesome. Thanks for doing a giveaway. I just finished a cake decorating class. This cook book would be super fun to get and help me continue learning the art of decorating! Love this! Who doesn’t need adorable cookies in their life!?! My favorite dessert at Christmas are Gingerbread bars! I love making cookies for Christmas. This book would come in handy! We love to celebrate Christmas. My favorite holiday is Thanksgiving. Any holiday that’s all about food and where you don’t have to buy presents for anyone is perfect in my book! Christmas is my favorite, but i like Halloween a lot too! I love how some of these cookie cutters look like they wouldn’t be too hard to find or I could use another shape and ice it to look like the right shape. I would love to win this! This book looks amazing! Thanks for the giveaway! I like to celebrate birthdays. My favorite to celebrate is Christmas! I love to celebrate holidays and people with cookies, especially Christmas and Halloween. I love celebrating holidays and birthdays my favorite is probably Valentine’s Day and Halloween is a close second. These are so cute! I’ve decorated cookies for Christmas, Valentine’s, and March Madness…very, very basic cookies. I love to celebrate birthdays, I think because with a family you have more than 1 a year. Thanks! I love thanksgiving & celebrating the count down to Christmas!! I celebrate my daughter. Any activity I can do with her is a celebration. I love to celebrate birthdays! I love this kind of stuff!! thanks for sharing – I’m going to go and check her out ASAP. I love celebrating Christmas the most, followed by the birthdays of my sweet hubby and 4 kiddos. And I can pretty much find any occasion for a cookie! This cookbook would be so fun to have for birthdays and other occasions! I love celebrating birthdays! It gives me a good reason to do some baking! I love celebrating my husband he is so amazing! My favorite thing to celebrate is my kids birthdays! Those cookies are the cutest! Last Christmas I tried your fancy icing on sugar cookies and I couldn’t believe how easy it was to make cookies look really good (after years of seriously failing with buttercream). I’d love to try this book out and see what I can do! We love October at our house–one of our daughter’s birthdays, our anniversary, awesome weather and sports, and halloween! Lots of my favorite things. These cookies look amazing. My favorite thing to celebrate is probably my kid’s birthdays! They are getting older but I still love to have a day that’s all about them! I love celebrating the weekend! I make a yummy treat or go out! I would love to learn how to decorate so cookies look so pretty! My favorite thing is baking. I love to see people react when they taste something super awesome! love making cookies with my daughters and Grand kids this book would be wonderful. I love celebrating anything that involves desert…let’s be real!! My family has done an annual Christmas cookie decorating party for the last 20 years…this book would be perfect! That is my favorite Christmas tradition! I love to celebrate my kids birthdays with them! This book looks amazing from what you have shown us. Can’t wait to see the rest of it!!! Would be great to bake cookies for the grandkids birthdays. Favorite thing to celebrate is Christmas or Easter because we’re celebrating Jesus Christ! I love to celebrate my husband’s birthday because I enjoy preparing his favorite foods. I love to celebrate Christmas now that I have kids. I love any holiday as long as I am with family. I love to celebrate birthdays! It is fun to spoil/be spoiled for a day. I cook more for Christmas than any other time of year. But baking anything is always my favorite “cooking”—–anything with lots of sugar!! Oh I LOVE holiday cookies and would love to learn how to do them better! I intend to celebrate BIG when my almost-4-year-old son is *finally* toilet trained! I LOVE LOVE LOVE to celebrate birthdays!! For friends, family and really anyone! I even make special treats for my trainers!!! I love to bake from scratch cakes or pies for my kids birthdays. What a fun book to have…my eight year old loves to make and decorate cookies!! LOVE baking for the fall and Christmas the most. But really, any special occasion is fun to celebrate! I need this cookbook in my kitchen! Love all things Christmas but especially making Christmas cookies. Great book, too! I love Bridget’s blog and have been following her for several years. She’s a pro at decorating cookies! And my favorite holiday to celebrate (especially with cookies) is Christmas! I love making Thanksgiving pies – apple, pumpkin cheesecake, pecan… YUM! My favorite is Christmas baking! Christmas is the most fun holiday to celebrate! Every we bake Christmas treats for all our closest friends and deliver them with a note of love and appreciation! Love the time baking with my kids! Hi! My FAVORITE person(s) would be my family. Now that the children are gone, I really miss the special times we had with each other…although I have great times with my grandchildren. I love doing activities with my husband. My favorite thing is anything pink and sparkly. I think that’s why I love easter so much! Great giveaway! I love to celebrate halloween and christmas! Thanks! Would so love this cookbook! So many cute ideas for cookies. I would love to win this book. One of my favorite holiday activities is baking. I love celebrating my kids’ birthdays! I would love to make fun Christmas cookies or something using this book! Favorite person(s) to celebrate are my two little girls!!! These cookies are beautiful! Almost too cute too eat. I have been trying hard to perfect my cookie decorating! Baking and decorating cookies is a must when the 6 grandchildren come to visit……Would absolutely love the cookbook….amazing cookies! Favorite thing to celebrate is Christmas. I hostess a cookie exchange each year where we each bring a type of cookie to exchange, plus decorate cut-out cookies as a group. Super fun! I absolutely love Halloween and Thanksgiving, everything about autumn! What a great prize this would be. I like to bake, but my decorating skills need help! I love to celebrate all the holidays! I go all out and decorate the house, make holiday foods, etc. My very favorite holidays are Valentine’s Day and Halloween. We love Halloween and it’s one of a few times during the year we’ll make sugar cookies…but Bridget’s book might inspire more baking. Thanks! I would love to win this great set…a little baking with my grandkids would be wonderful! I have a collection of cookie cutters that’s taking over my kitchen and I bake cutout cookies for any reason I can think of! Thanksgiving is the favorite holiday in our home! We love making and door ditching cookies for Christmas. These would be so fun! I love celebrating the four Advents during Christmas time! It is a tradition I picked up while I lived in Germany, and it is hands-down our very favorite family time at Christmas! I celebrate Friday nights! It’s the only night my husband and I have together! We love Halloween! It’s my husband’s favorite holiday! I have always been so intimidated by pretty cookies, but it is on my list of things I want to accomplish soon. I am much better at the style of decorating that comes with being a mom to small kids… hurry and try to slap on some frosting and sprinkles before someone ruins it! Celebrating holidays would be so fun with this skill! Thanksgiving and Christmas are my favorites since the extended families get together. Thanks for the opportunity to win items on your blog. I would love to try decorating cookies. So far I have stuck with cakes and it is time to try something new!! I love birthdays. Especially my kids!! I would love this cookbook. I have been wanting to learn how to decorate cookies. I love Bridget’s blog! This would be a great book for my collection. I love the end of the year holidays, so much fun to celebrate with my kids and husband. I love celebrating all occasions. The cookies in that book are just adorable! How fun would it be to learn how to do that! I love celebrating my students birthdays, accomplishments, etc! They get so excited and their happiness and joy warm my heart! I would seriously love that! Baking is one of my favorite things! I love celebrating the Christmas season. So much love seems to be in the air. I love celebrating and decorating for Halloween; it’s my favorite holiday. I love all the family getting together at Thanksgiving and the anticipation of Christmas and how love seems to fill the air! I’m in a baking mood! Bring on the cookies! Valentines Day doesn’t happen without cookies at my house… Usually pink frosted hearts. The end of the semester! I’m a teacher so celebrating each semester is a must! My favorite thing is baking. I don’t necessarily need to eat it, I just like trying to make new things. I used to be really bad about reading and following directions, but I’ve gotten much better at it! My favorite holiday is Thanksgiving!! Never had a cookie decorating book! I love birthdays because it is the one day that is solely your own. Other holidays are awesome but they are shared. Its fun on birthdays that you are the star of the show. Wow! These cookies are works of art! It would be so fun to decorate sugar cookies for Christmas or Easter to give away. I love a lot of things but my favorite day is my anniversary–my husband and I love to spend the day together. I have 4 daughters and we LOVE decorating cookies! This would be so much fun!! i just worked on saturday so i want to celebrate having days off!! I love decorating cookies for Halloween and Christmas of course! I’ve done a lot of baking; however, I have not mastered the sugar cookie decorating. This looks like a fantastic book — beautiful works of love!! So CUTE! I need to pop over to her blog and look around! My kids are my favorite “thing” to celebrate. I would love to try some new cookie recipes! I love just celebrating in general, but I especially love celebrating all the holidays with my kids! I love love love celebrating Christmas! Christmas is my favorite holiday to celebrate – the music, food, decorations – I love it all! I love cookies, but I don’t often decorate them because that feels like tedious and unappreciated work. But if I had the right recipes and tips/tricks, I would love the artistry of it 🙂 Thanks for sponsoring this giveaway! I love celebrating holidays. I love the excitement, the decorations. I love Christmas, Halloween, Thanksgiving, Easter, pretty much all of the holidays. Love buying gifts, love birthdays. My favorite thing to celebrate is Halloween! I love making costumes, baked goods, and giving treats out to trick-or-treaters. It’s such a fun time! So fun! I just made your sugar cookies and LOVE THEM but my frosting, while it tasted good, didn’t look anything like hers. I’d love to learn how to frost a beautiful sugar cookie. Love decorating cookies, but I’m not very good at it! Would love to learn some tips and tricks! Oh, and I like celebrating Christmas! I love to celebrate my kids and the crazy wonderful way they have of looking at the world. I enjoy celebrating Thanksgiving. The focus is on family/friends/food and not on shopping. It’s a great time to catch up with others.